STADIO is an investment holding company that focuses on the acquisition of, investment in, growth and development of higher education institutions to assist in meeting the demand for quality and relevant higher education programmes in southern Africa. STADIO intends to grow existing registered higher education brands, to acquire further relevant higher education institutions, fund further expansions of existing brands and oversee the greenfield development of new campuses. STADIO started as a subsidiary of Curro Holdings Limited (Curro). Curro has been a proud provider of pre-school and school-based education since 1998 and was listed on the JSE in 2011. 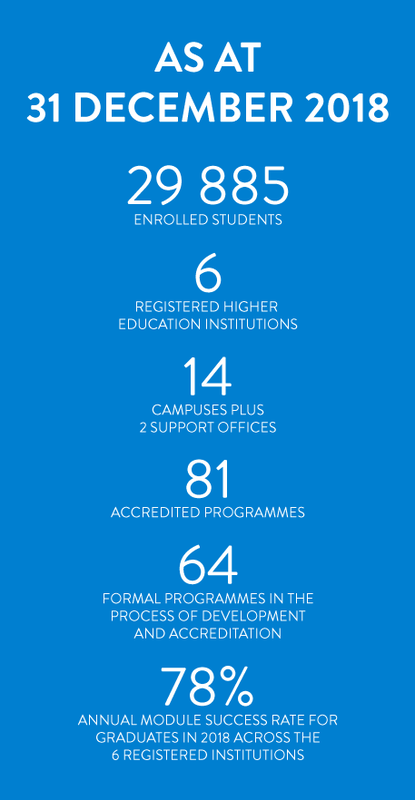 Curro is currently the largest for-profit independent school group in Africa, providing education services to approximately 52 233 learners in 138 schools across South Africa and Namibia. In 2013, Curro acquired Embury, a registered private higher education institution, which offers accredited teacher-education qualifications. The acquisition of Embury was Curro’s first investment in the post-school education environment. In light of the opportunities presented in the post-school education market, it was a natural progression for Curro to develop and expand its post-school education offering. The Latin word 'curro' can be translated into English as 'I run' and the Italian word 'stadio', can be translated into English as 'stadium'. In ancient Rome, long-distance races required athletes to run from stadium to stadium to reach the finish line. The progression from Curro to STADIO symbolises the fact that STADIO is the way in which the race for education will be continued. It also epitomises the ethos of 'continuing' (lifelong) learning. On 28 February 2017 Curro announced its intention to unbundle its entire interest in STADIO and to list STADIO on the JSE. The intention of the unbundling and listing was to create a separate listed business, focusing on higher education, with a strong management team and a dedicated anchor shareholder (namely PSG Group Limited) in order to become a leader in the higher education market in South Africa. To achieve this goal, STADIO successfully acquired various higher education institutions in its strategy to create a Multiversity. A Multiversity is defined as a large, diverse institution of higher learning created to educate for life and for a profession, and to grant degrees (including higher certificates and diplomas). A Multiversity implies a DIVERSITY of knowledge with diverse specialist institutions catering for the diverse and relevant needs of the South African market-place. The concept of a Multiversity further respects the uniqueness of every student. As a Multiversity, STADIO owns various registered higher education institutions, which have retained their own brands, campuses and management teams, but will share a common ethos and benefit from the synergies, infrastructure and shared services arising from the Group structure. The Group has diverse offerings including undergraduate (higher certificates, diplomas and degrees) and post-graduate programmes (honours and masters degrees and doctorate), aimed at providing graduates with a real chance of creating employment opportunities (entrepreneurship) or finding employment. As the investment holding company of the various education institutions, STADIO will monitor the business’ success and drive efficiencies, innovations and best practices across the Group. STADIO was listed on the JSE main board on 3 October 2017. Dr Chris van der Merwe, founder of Curro and its CEO since 1999, is the CEO of STADIO.